TRADITIONAL PROBLEM: Due to their size swim spas require the use of two covers. When you close both covers with or without a traditional lifter you need to shift them around and squeeze them together. This often requires assistance which is not always available and/or access to all sides of the swim spa. If the two covers are not securely squeezed together on an outdoor installation you will lose energy efficiency along with having your swim spa overflow with the entry of rain water. Loss of efficiency can be costly on a swim spa and the entry of rain water is not only expensive but damaging to your water’s chemistry, requiring the use of additional chemicals. If the two covers are not securely squeezed together on an indoor installation, in a room that is not adequately vented, and your water is not properly sanitized, fumes could enter into the room that may be dangerous to your health. VACUSEAL SOLUTION: The VacuSeal Lifter is securely attached to both covers on all sides with a patented clamping system and is securely attached to both covers on all four exterior corners with our patented sliding bracket. This unique attachment process assures that each and every time you remove and replace your VacuSeal Covers they will both form a seal eliminating the need for you to shift and squeeze them together!!! We even specially designed the ends of the two covers to form a full seal from top to bottom to enhance the seal! TRADITIONAL PROBLEM: Every swim spa requires you to fold each cover in half and then physically remove the covers or use a traditional lifter that requires you to shift and squeeze each side together when exiting your spa. These events require effort and assistance, and space on all sides. VACUSEAL SOLUTION: Each side of the cover can be removed and replace in a matter of seconds from either side of the swim spa without the assistance of a friend. Most owners exercise in their swim spa independently so the ability to operate the cover and lifter without assistance is critical. TRADITIONAL PROBLEM: Since most covers can only be built up to 8’ in length, Swim Spas that are over 16’ long often require a third interior cover to fit between the two primary covers. This internal center cover must be lifted by hand which is quite burdensome and most often very energy inefficient. 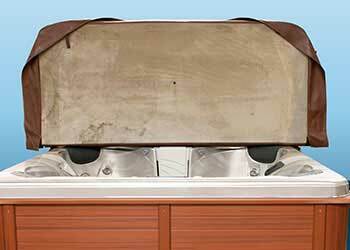 Even oversized hot tubs and exercise spas over 8’ long have difficulties in finding easily operational covers. 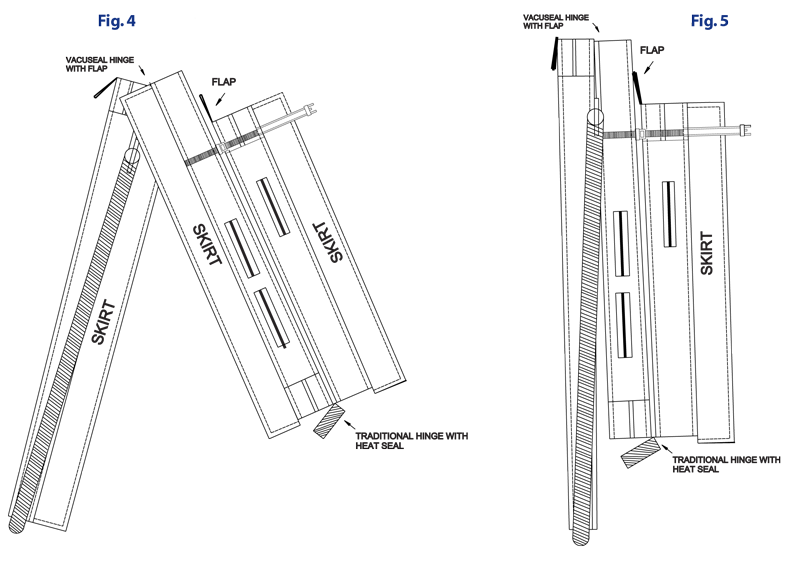 VACUSEAL SOLUTION: Our VacuSeal patented design is now available in a Three Part Cover. This allows us to provide the only Swim Spa Cover/Lifter system that will work on Swim Spas up to 21’ long along with providing a Cover/Lifter systems for Hot Tubs up to 10’ long!!! 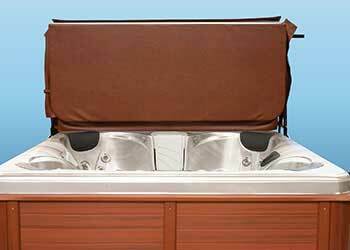 Our Patented 3 part, accordion design, cover is designed to be the perfect solution for hot tubs up to 10.5 in length and Swim Spas up to 21’ in length. 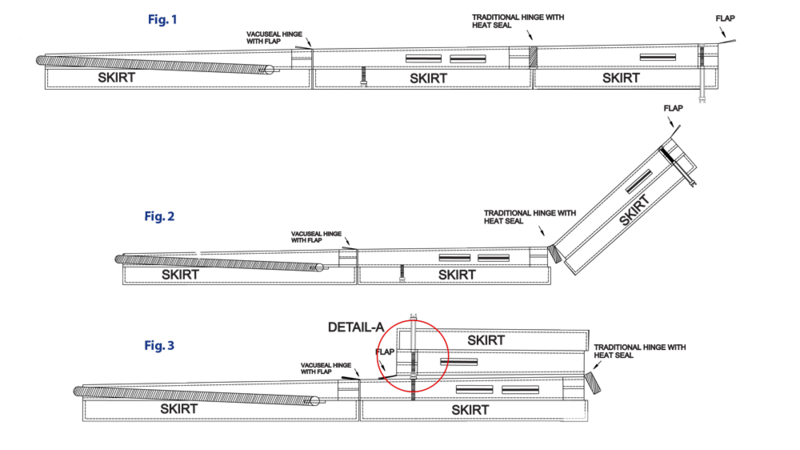 The Three Part System works by simply folding a Third Part over onto the Middle Part (snap locking the two parts together) and then lifting the cover in the same VacuSeal inward fashion with the assistance of our dual gas shocks. Now available a New Extended Support Bracket that allows you to install the VacuSeal Cover/Lift system on hot tubs with a radius up to 15”. This unique bracket provides all the support required for large radius hot tubs and is recommended on hot tubs that have over a 10” radius. The VacuSeal Swim Spa Cover Lifter works solely in conjunction with VacuSeal Covers. 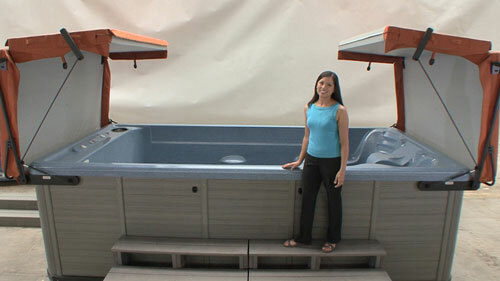 This guarantees that you receive the best built covers in the hot tub/swim spa industry. All VacuSeal Swim Spa covers come standard in the highest grade marine grade vinyl in a choice of ten designer colors. Or you can upgrade to Sunbrella, a fabric that is 50% less in weight and provides an elegant upscale addition to your swim spa. For those seeking protection from the sun, or would like to use their swim spa in the rain or snow, or simply want a little more privacy, either or both sides of the VacuSeal Swim Spa Covers can easily be converted into a canopy. The VacuSeal Cover opens inwardly so that you’re always facing the attractive exterior side of the cover which is easily cleaned and not directly exposed to chemical damage. Every other cover folds over and up so that the user is facing the gray underside which within quickly becomes stained by the off gasses of the spa chemicals. VacuSeal Covers come standard with straps that include key locking systems to secure your cover to the hot tub cabinet. Our VacuSeal Lifter offers a secure steel locking mechanism to also lock the lifter to the cabinet as well.